Yesterday, my column “10 Reasons The United States Is No Longer The Land Of The Free” ran in the Sunday Washington Post. I have been heartened by response to the column. However, a few commenters continue to suggest that the National Defense Authorization Act (NDAA) does not allow for the indefinite detention of citizens. This claim is being advanced by Senator Carl Levin (D., Mich.) in emails and fax messages to voters. I wanted to respond to Senator Levin’s points which are detached from language of the law and the clear intent of the majority of Senators. I would also like to address those who have stated that our liberties are not at risk when such powers will not affect most Americans. First, this provision was added after an amendment to exempt citizens was defeated by the Senate — legislative history that any court is likely to note in the interpretation of its meaning. Second, the fact that the Senate put a clear exemption in the mandatory detention provision for citizens but opted not to simply include the same provision in the discretionary detention provision reinforces this meaning. Third, after the exemption for citizens was defeated overwhelmingly, the same Senators who voted to deny any exemption proceeded to vote for this language — clearly indicating that it did not offer such protection for citizens. Fourth, Levin and others are seeking to deny the authority that the President just acknowledged in his signing statement. Obama stated “I want to clarify that my Administration will not authorize the indefinite military detention without trial of American citizens.” He does not deny that he has such authority . . . only that he does not intend to use it. Is the Senator familiar with the fact that it was the administration which asked us to remove the very language which we had in the bill which passed the committee, and that we removed it at the request of the administration that this determination would not apply to U.S. citizens and lawful residents? Is the Senator familiar with the fact that it was the administration which asked us to remove the very language, the absence of which is now objected to by the Senator from Illinois? Seventh, the language that was ultimately put into the bill was standard cover language for Senators who knew that they would be criticized for voting for the law. Indeed, when Levin referred to the language, he insisted that it would merely permit what is already permitted by law “whatever it may be.” Of course, the White House has claimed the right to kill citizens on the president’s sole authority. The indefinite detention of citizens would seem the lesser included in such a greater. Moreover, the Senators refused to change the existing law by putting in an exemption for citizens. It is also worth noting that the White House has successfully opposed the right of citizens to present national security powers to federal courts for independent review. What is the “law” is often only the assertion of power by the President – unchecked by judicial review. Note the use of new authority. This is authority that has been claimed as being part of the President’s inherent authority — just as he claims the right to kill citizens. However, this law codifies new detention powers and the Senate expressly chose not to exempt citizens — and the President himself acknowledged the ability to indefinitely detain citizens in his pledge not to use it. Moreover, it was the duty of Levin and others to fight the passage of this law in the absence of an exemption, including fighting to use every power available from a filibuster to demanding a president veto. Instead, they took the political convenient approach and sought to excuse their act of constitutional nonfeasance behind this meaningless language. and I didn’t speak out because I was Protestant. Thankfully are we not facing the type of horror faced by Niemöller, but the logic is the same: I do not need to object unless the government denies me a right. Chris Hedges, senior fellow at the Nation Institute. He is a former foreign correspondent for the New York Times and was part of a team of reporters that was awarded a Pulitzer Prize in 2002 for the paper’s coverage of global terrorism. He is the author of a number of books, including Death of the Liberal Class and The World As It Is: Dispatches on the Myth of Human Progress. He is a plaintiff in a lawsuit challenging the National Defense Authorization Act. 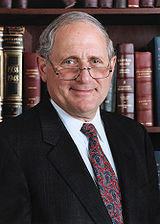 Bruce Afran, lawyer representing Chris Hedges and other plaintiffs in a lawsuit challenging the National Defense Authorization Act. AMY GOODMAN: So, what happens now? I mean, this was struck down by Judge Forrest. Where does it go now? BRUCE AFRAN: Well, technically, there could be a trial on a full issue of a permanent injunction. That very rarely ever happens. Usually, the government will appeal. They have 60 days to appeal. We don’t know what will happen. We, Carl Mayer and I, my co-counsel, are calling on the government to issue a permanent—agree to a permanent injunction, put this permanently, you know, under a rule that it is unconstitutional and can’t be enforced. Right now it is illegal. The judge has put a hold on it. And we’re calling on the President to agree to make it a permanent injunction. AMY GOODMAN: Chris Hedges, where do you go from here? CHRIS HEDGES: I think that, you know, this is a never-ending battle. The security and surveillance state has already boxed us in, those of us who don’t conform to the official narrative. And this was a tremendous victory, but there are still important issues to be fought. The Espionage Act is a good one, the Authorization to Use Military Force Act itself, the PATRIOT Act, the refusal to restore habeas corpus, of course the FISA Amendment Act, the warrantless wiretapping. There are still other issues that those of us who care about an open democracy have to go out and fight for. AMY GOODMAN: I want to thank you both for being with us, Chris Hedges, senior fellow at the Nation Institute, former correspondent for the New York Times; Bruce Afran, lawyer representing Chris Hedges and the other plaintiffs in this lawsuit challenging the National Defense Authorization Act. Judge Forrest has struck down the statute that would allow for the indefinite detention of anyone anywhere considered a terrorism suspect, without charge, without trial, including U.S. citizens.